With the fast development of Wood Pellets industry, flat die pellet mill becomes very popular in the world. It has the advantages of low price, low consumption, high capacity, etc. It is a good choice for small farming families. It is one kind of energy source machine which can process wood sawdust, wood lump, and is an agro-waste resource. The Flat Die Pelleting Presses/oil cake Granulator can process oil cake and other mixed waste materials all at one time. It is columned granule feed and have slippery firm. 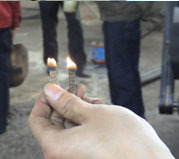 During the process of producing granule, the temperature can almost reach 70—80 centigrade. 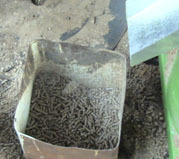 The flat die pelleting presses can make fecula into paste. The inner granule is cooked and fully penetrated, and is not easy to go moldy or degenerative. Then Flat Die Pellet Mill can be stored for a long time and will improve poultry dainty and assimilation function. It also can shorten the period of feeding, so this flat die pelleting presses can efficiently reduce many users' productive cost. 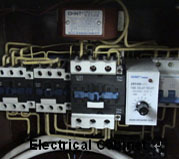 The following series is designed with Electric motor with enclosure. 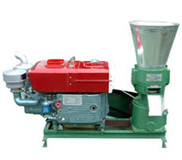 There is also another Pellet Mill with Rotating Roller. The best moisture content for wood pelletizer is between 13%-15%. The best size of raw material granule is under 4mm in diameter.